This entry was posted in Hens by Country lover. Bookmark the permalink. Fabulous! Keep thinking about getting hens. If you do, make sure that they were handled as chicks. It makes it so much easier to care for them if you can pick them up. Mine are all semi wild and I can’t get near them to treat scaley leg or whatever. Those in the know say they will allow you to pick them up after they have been roosting for a bit (all sleepy), but not so easy in the winter, to do anything in the dark! What a handsome chuck! I would also love to keep some hens. Still trying to persuade Him Outdoors. It’s a slow process but I hope to have cracked him by the time the weather warms up!! If ‘him outdoors’ is a gardener, then they should be in a run, the bigger the better. As they destroy the garden. From the spring mine will only be able to go out on half of the paddock, and not the garden. I had put a membrane under my gravel to stop the weeds coming through, and they have scratched it all up. They have the annoying habit of scrabbling about in the flowerbeds, bottoms towards the lawn and kicking all the soil and stones out backwards! It’s a pain when the lawn is to be cut as you have to sweep all the stones back into the flowerbeds!! So, be warned chickens and gardens don’t mix! Yep they always get their mixed corn in the afternoon. They come running for it, well that is if they haven’t been foraging under the garden bird feeders! Great shot – love the expression on Mrs Hen’s face – she looks a bit peeved! Polly is a funny hen. The alpha hen since Hettie died. But whenever there’s food around it’s always a case of ‘the grass tastes greener’ and she runs around like a clockwork mouse trying to take over the food that the other hens might be eating! 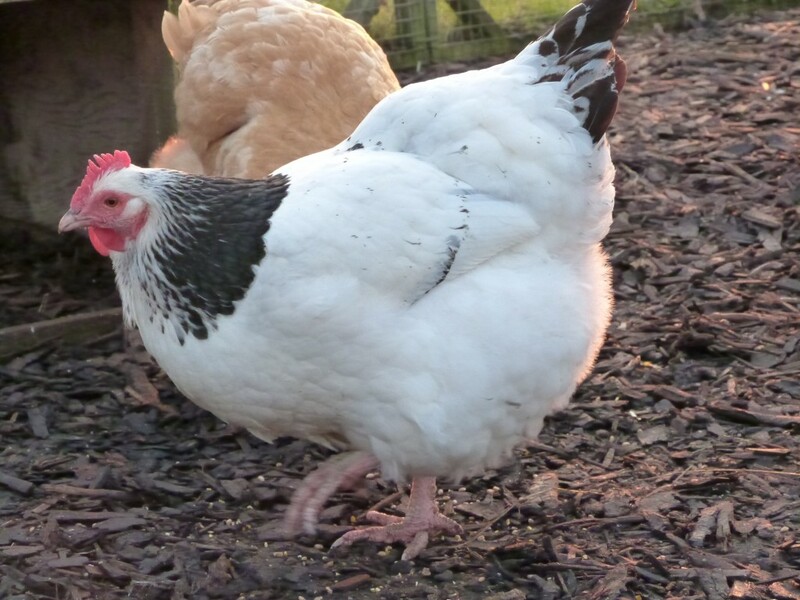 In saying that she is quite a jolly hen, not grumpy like Dotty! They all have very different characters and I could spend hours watching them! Dotty, the cuckoo marron must be 7 years old and doesn’t lay anymore. Winnie, the Welsummer never laid very well and last year hardly laid at all. They really should be culled, but I can’t do it and there is no ‘ol boy’ in the village whom I could call in to do the dastardly deed! So they lead the life of Riley, not giving me anything in return. Ho hum such is life! Hi there, simply became aware of your weblog through Google, and located that it’s really informative. I’m gonna watch out for brussels. I will be grateful when you continue this in future. Numerous folks will likely be benefited out of your writing. Cheers! Thanks so much for visiting my blog and reading my swallows post and am so glad you like it. Please do come again and hopefully if I can work out how to load the ‘follow me’ or ‘sign up’ widgit/plugin thingey you will be able to sign up, if you want to..
Hello, thanks very much Fiona for visiting my new blog. It looks so bare compared with your’s, which is very colourful and jolly. But, I’m slowly learning how to do things! Thanks Fiona, have just found your comment, with lots of others, in my Spam folder, which I didn’t know I had. Will have to check it out regularly! love the idea of silence, so much endless gabbling and chattering and it’s hard to find a silent spot in this world. Even at home yesterday my silence was suddenly wrecked by next door’s blasted telly burbling and whining through the wall. I had to put Prokofiev on at full blast to drown it out with something at least bearable. I love silence, I think I can say it’s my favourite sound. but very hard to find, as I say. So the silent Sunday spot is a great idea, good for you! I’ll try to join in, but may be defeated by the technology of uploading ….